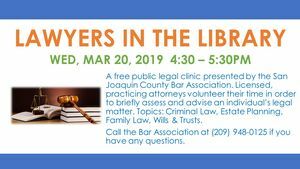 Lawyers in the Library is a free public legal clinic presented by the San Joaquin County Bar Association. Licensed, practicing attorneys volunteer their time in order to briefly assess and advise an individual’s legal matter. There are no income or residency requirements. Services are provided free to any members of the public for a short face-to-face meeting with an attorney. All people will be seen on a first-come-first-serve basis. Call the Bar Association at (209) 948-0125 if you have any questions.